Para garantizarte la mejor experiencia, Tropical Paradise utiliza cookies propias y de terceros en su página web, con fines técnicos, analíticos y de marketing. Si continúas navegando por nuestra web, entendemos que aceptas este uso de las cookies. Para más información, consulta nuestro Aviso de cookies. Explore the beautiful Hol-Chan Marine Park, Belize’s first marine park. Snorkel with a wide variety of marine life including large schools of colorful fish, octopus, Turtle and barracudas. This tour includes a snorkel stop at the Shark Ray Alley, an incredible opportunity to snorkel with gentle nurse sharks and tamed sting rays. Our last stop is the Coral Gardens, a beautiful underwater garden of various corals and fish. Chance to see Manatees (Seasonal) Includes snorkel gear, fruits, entrance fees, water, and a packed lunch. 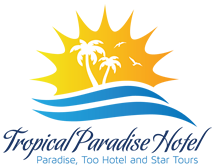 Tour Time Span: 10:30 a.m. – 4:30 p.m.
Quiero recibir e-mails, noticias y newsletters de Tropical Paradise.